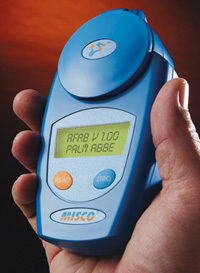 The Palm Abbe handhelds are simply the most accurate handheld refractometers available - PERIOD. They are fast, convenient, and easy to use. Simply place a drop or two of fluid in the well and press a button on the keypad. The custom-designed microprocessor delivers a nearly instantaneous readout in refractive index, degrees Brix, or any one of a thousand different units of measure, allowing you to read directly in the units you desire. Nonlinear temperature compensation is automatic and insures that fluids read between 0 and 50 °C (+32 to 122 °F) are measured accurately. The large dual-line LCD display is easily read, even in dim light, and removes the subjectivity associated with interpreting where a boundary line crosses tiny scale divisions. And, it is so easy to use! The user interface consists of two buttons, one to take readings and the other to step through various menu options. The Palm Abbe fits like a glove in the palm of your hand. The weight of its evenly-balanced design can be held easily in any size hand, even during extended periods of use. The positive response buttons on the keypad provide tactile feedback to the operator when pressed. A strong plastic enclosure is sealed to guard against liquid and dust penetration, while an integrated prism cover helps prevent sample evaporation and protects the sapphire measuring surface from possible damage. The cover also shields the optics from the influence of strong ambient light, making the Palm Abbe ideal for use indoors or in direct sunlight. Because the Palm Abbe offers great performance and accuracy at a very affordable price, there is no need to make trade-offs between accuracy and affordability. The Palm Abbe provides high-end performance and precision at a low price; making the Palm Abbe one of the best values available. * X DENOTES CUSTOM SCALE - MANY MORE SCALES AVAILABLE - PLEASE CALL FOR DETAILS. The DR series Digital Hand Refractometers are easy-to-use battery-powered instruments, ideal for Brix measurements on fruits and fruit juices, soft drinks, and other food products. Models are available that provide multiple measurements, with selections for Brix, salinity (for ketchup, mayonnaise, pickle juice, etc.) or Refractive Index. We also provide models suitable for applications in veterinarian or medical/clinical usage, the automotive industry, and machine coolant industrial applications for cutting and quenching oils. These instruments automatically compensate for sample temperatures as measured at the prism surface, and this temperature can also be displayed on demand at the press of a button.